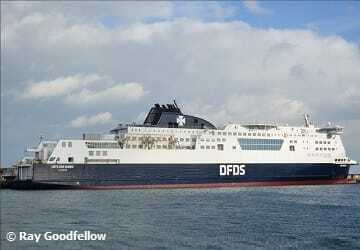 The DFDS Seaways ferries can carry in excess of 1900 passengers, with ample space for passenger and freight vehicles. The state of the art vessels include a choice of bars, cafes and restaurants, as well as a shop for any last minute purchases or souvenir buying. Travellers of all ages will find plenty to keep them occupied whilst on board, with a designated kids area, video games section and plenty of areas to relax and take in the sea vistas. Premium Lounge seating provides those seeking a more luxurious journey with the ideal setting. As well as private area seating you are treated to complimentary food and drinks, newspapers and have the option to kick back and watch some TV. From your comfortable chair you can enjoy beautiful sea views. On board, you will find a self-service restaurant serving a range of delicious hot and cold dishes, freshly cooked throughout the day. Vegetarian alternatives and children's options are also available. If you would prefer something lighter, there are also plenty of cafes and bars where you can relax and admire the superb sea views. You don’t have to just sit around whilst making your crossing, with DFDS you can indulge in some retail therapy and maybe treat yourself to a little something while on the move. The Sea Shop includes great deals on fragrances, skincare and cosmetics, as well as being stocked up on gifts, souvenirs, magazines, books and sweets. The kids can also enjoy the range of goods with plenty to choose from the toys and games selection. Don’t worry if you’ve forgotten to pack some of your much needed holiday essentials. You can find everything from phrase books, maps and guides to toiletries and adaptors. Keeping the little ones can prove to be one of the greatest challenges when travelling abroad but this is made a lot easier with a dedicated soft play area. Here they can safely run around, burn some energy and enjoy the journey. Those youngsters who have outgrown the play area can pass the time in the arcade area, where they will find a number of video and racing games. The C Class vessels all have lift access parking, passenger lifts so you can move freely between the decks and wheelchair accessible public toilet facilities. Please Note: Whilst we have taken great care in making our C Class guide as accurate as possible, onboard facilities, services and entertainment may vary depending on the date and time of year that you travel, facilities mentioned may change without notification and ferry companies reserve the right to operate vessels other than those mentioned at time of booking without prior notification. Lovely spacious boat. Boarding was easy and they bumped us up a crossing at Dover, which was really helpful. We may not use again, however, as the hot drinks were awful and overpriced. A great way to relax before a long drive through Europe, wish it could take me all the way rather than driving. First class rapid service never had a problem with any bookings made with Directferries. Good experience and I liked the lower price on our crossing. Will take again in the future. Second time booking with Direct Ferries, easy to use website, no problems at all, would deffinately recommend them. Very good crossing, best price,very efficient. Use dfds most of the time. Good, ran smoothly no problems. 15 minute delay in return journey. Other than that totally enjoyable experience. "Trip from Dover to calais"